For Russia, the geographical unevenness in the financial development is obvious. There are marked political and institutional reasons for Moscow’s dominance. Nevertheless, the spatial transformation of the Russian banking system can be considered from the point of view of regularities and trends revealed in contemporary international financial geography. We examine the role of the Russian banking system with regard to the allocation of financial resources across Russian regions. Over the past two decades, there had been a steady decline in the number of Russian banks. The results is an increasingly Moscow-centred and state-oriented banking system with large banking networks at the expense of smaller private and regional banks. We use information from the Central Bank of Russia (CBR) to investigate the role of the Moscow-based banking networks in lending to regional economies outside Moscow. We conclude that the centralized economy is complemented by a highly centralized banking system. Moscow accommodates the head offices of the major non-financial companies of the whole country. It is the place where not only the private sector’s but also the state’s financial resources are concentrated. Large network banks, headquartered mainly in Moscow, provide regular flows of financial resources from the capital to local offices elsewhere in the country in order to enable firm and household lending. Hence, the system provides a kind of “reverse flow” of funds to the peripheral regions of the country. We pay specific attention to the problem of financing small and medium-sized enterprises (SMEs) in Russia. We examine the “flight to home” and “flight to quality” effects during the crisis period after 2014, when oil prices had fallen and economic sanctions were imposed, and find that lending to SMEs in the peripheral regions remains vulnerable in such a situation. There was a reduction of this “reverse flow” of funds from the Moscow head offices to local offices during the crisis period after 2014 and a shift in lending to firms and SMEs in favour of Moscow firms at the expense of regional ones. This “flight to home” is typical for the Russian economy during the crisis period, as it is in other countries with centralized banking systems. and relative terms. This fall is more pronounced in the Russian peripheral regions than in Moscow. There reasons were not only CBR’s “cleaning policy” and its tighter requirements for banks in servicing SMEs but an obvious “flight to quality” effect as a reaction of the banking system to the crisis. We also find that the sector of smaller regional banks in Russia – despite its shrinking size – remains biased in favour of small firms. 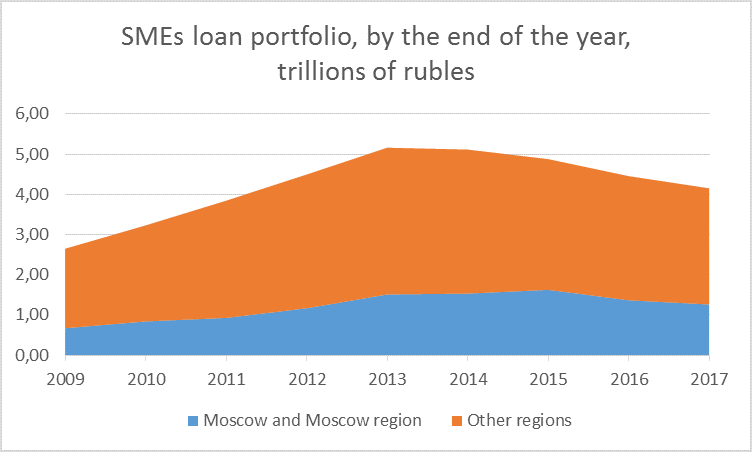 So to improve the institutional environment in Russia in more favourable ways for SME lending it could be a solution to strengthen medium, small and regional banks. But with the general super-concentration of businesses and finance in Moscow, this policy might be hard to implement and unreasonable due to the prominent role of the large Moscow banks in redistributing finance from the capital city to other regions. In such a situation, SME lending and the economy’s development are held hostage to the overall concentration of finance in Moscow. Lending to SMEs and new enterprises remains vulnerable and largely dependent on government support programs (though their effectiveness is unclear). Hence, it is hardly worth to expect any successful independent development of SMEs in Russia and the increase of their share in Russia’s GDP. Our paper contributes to the research field on financialisation in post-socialist countries. We try to investigate the role of financialisation in formation of the patterns of uneven development in Russia. The Russian economy was previously built on a completely opposite logic to that of financialisation, and then, a dramatic reorganisation of the entire financial infrastructure had occurred. At that juncture, a very specific system of financial infrastructure emerged with some features and tendencies of contemporary western financial systems.